Nana P. I am re-activating this expired deal. I will update it and validate that it works. The coupon code is valid. To redeem the offer, shop for any item on the site and use the code during the online checkout process. Eduard Espinoza This deal was tested and worked as described. Add indicated products and apply the code at checkout to get the discount. German This deal was verified and it is working as described. 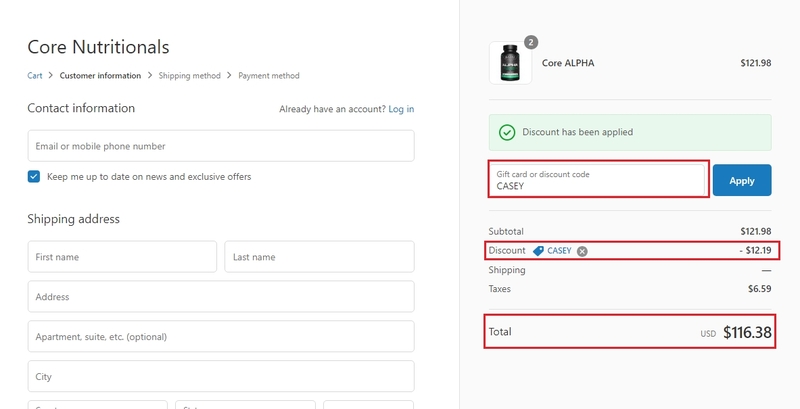 Select the items and enter the promo code <CASEY> at checkout to get 10% off your order at Core Nutritionals. jose david the code works as indicated. Get 10% Off at Core Nutritionals (Site-Wide). Some exclusions apply. nelson eduardo sanchez This is a great thing. Simply enter the coupon code in the space provided in your shopping cart and click "Apply" to obtain the discount. Exclusions may apply.